Aidan Gets His Driver’s License. Aidan shows off his driver’s license. His hands shook at the beginning of the road test, and the inspector had to tell him to drive closer to the speed limit of 35 miles per hour, but Aidan is now one of the latest licensed drivers in the Land of Lincoln. The ride over to the registry where he had passed his permit test nearly a year ago was a tad ponderous. Preparing for the test, Aidan made sure not to drive over the speed limit on Golf Road, with the result that a line of cars with impatient drivers assembled behind him in the fast lane. After waiting through three different lines at the registry, one of which directed us to the same spot where he had taken the permit test, we both were in the car waiting for his examiner. A few minutes later, George, a portly man with glasses and a South Asian accent, entered the car. “Excuse me, Sir, but you have to leave,” he said after telling me that we did not need to show him the car’s registration. Fifteen minutes and a call to Dunreith later, Aidan returned, that much closer to independence and adulthood. 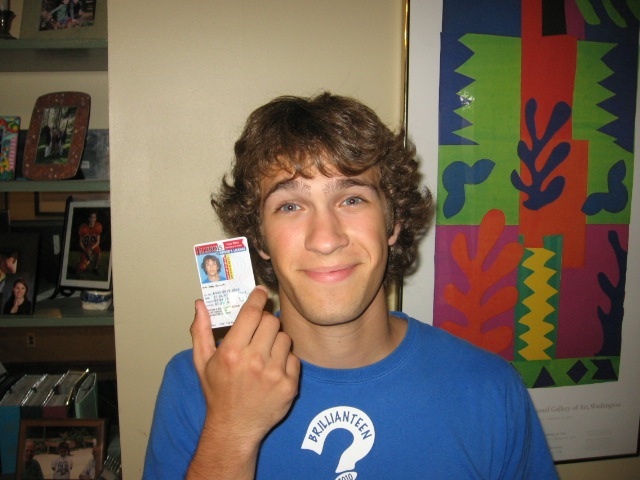 He took the license picture – “a real bro shot,” he said admiringly – before heading back into the car to drive us home at a much brisker pace than the first trip. On the way back home, we started on our first post-license topics. These topics were broached amiably enough, with a few agreements to disagree and some concessions in concept on both sides. I spoke to our insurance agent, who put Aidan on the policy. Aidan picked up his check from his job as a camp counselor, deposited it at Chase, and got ready to head out with the car to meet a friend. I congratulated him again and we hugged before he left. “I’m scared to be driving by myself,” he said, before reassuring me that he would do his best not to blow the car’s speakers out by the time he turned the corner at the end of the block. “I’ll be here if you need anything.” I told him. Aidan nodded before walking out the front door and onto the evening’s adventures. Memories of his first day of first grade, another landmark event when he had expressed fear before moving forward, and images of Dad’s taking me on the same experience 26 years before swirled around in my head. So, too, did pride in his accomplishment and sadness at time’s relentless passage. I watched as Aidan’s form retreated like a sailboat in the ocean, less and less visible until I could no longer see him. The crickets began their evening sonata, the sounds ascending into the overcast sky.